If you are a horse breeder, or offer horse related services such as horse supplies, tack, specialty products and enclosures, you will want to list your website here today! We receive lots of traffic at our popular horse directory every day! Each day we receive many visitors interested in anything and everything to do with horses. To list your website, please click the banner below, select the appropriate horse category that relates to your product or service, and then submit your website. CLICK HERE AND SIGNUP today, and take advantage of your free listing in our directory before list their websites above yours! 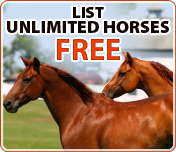 Find horse breeders, rare horse breeders and Horses for sale. 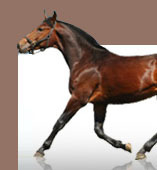 Horse health care products information and professionals such as Veterinarians. Find a adoption and horse rescue centers and websites. Adopt a horse for life! Horse Veterinarians play an important part in proper horse health care.